Input text: The small bed is on the floor. The [wood] texture is on the floor. The texture is 1 feet tall. The comb is on the bed. The comb is 4 feet tall. 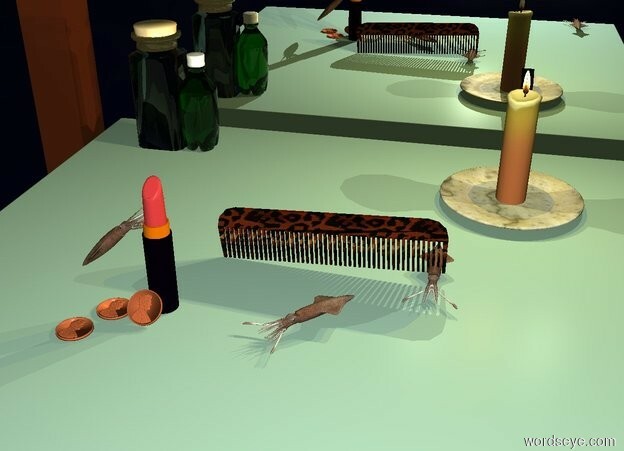 The comb is facing left. The comb is leaning 20 degrees to the right. The comb is -3 feet in front of the bed. There is a first [sky] wall -6 feet behind the floor. A second [sky] wall is to the right of the floor. The wall is facing left. 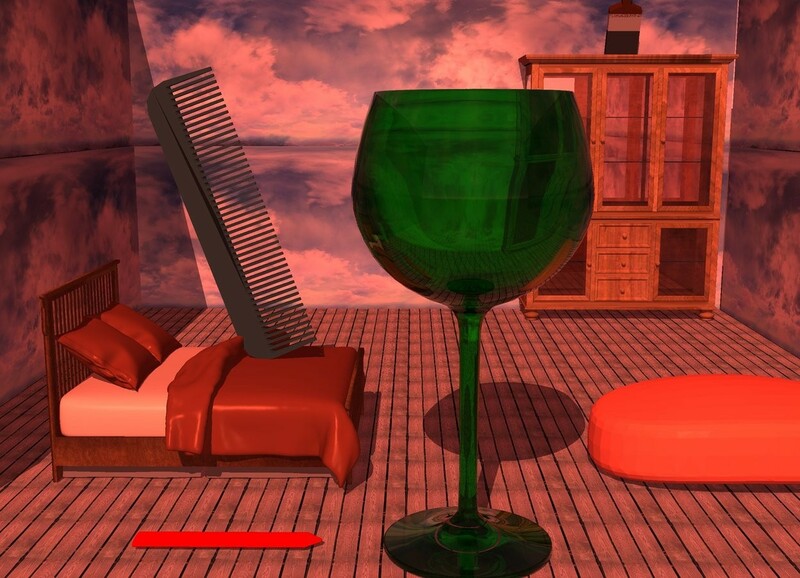 The very huge green wine glass is in front and to the left of the bed. The red pencil is 4 inches behind the wine glass. The pencil is face up. The pencil is 2 feet long and 4 inch wide. The cabinet is to the left of the second wall. The cabinet is facing left. The [wood] cabinet is -5 feet in front of the floor. The huge brush is on the cabinet. The brush is leaning to the front. The very huge peach soap is 6 inches in front and to the right of the wine glass. The soap is facing left. A third [sky] wall is in front of the floor. the camera light is dim cream. the ambient light is brown red. the sun is peach. @zamchick, your link isn't showing up as you probably intended. You need a slash before the closing url bbcode tag. You can click on the "Add url" button to see the format. Thanks...may have used a backslash. Will check tomorrow. so odd, I used it earlier and it worked fine. Honey, I Shrunk the Squids!